THE SPOTTED HARE: It's Wild Hare Wednesday! It's been some time since I've popped in with a "Wild Hare". cusp of another year, another chance to work better, do better & be better! 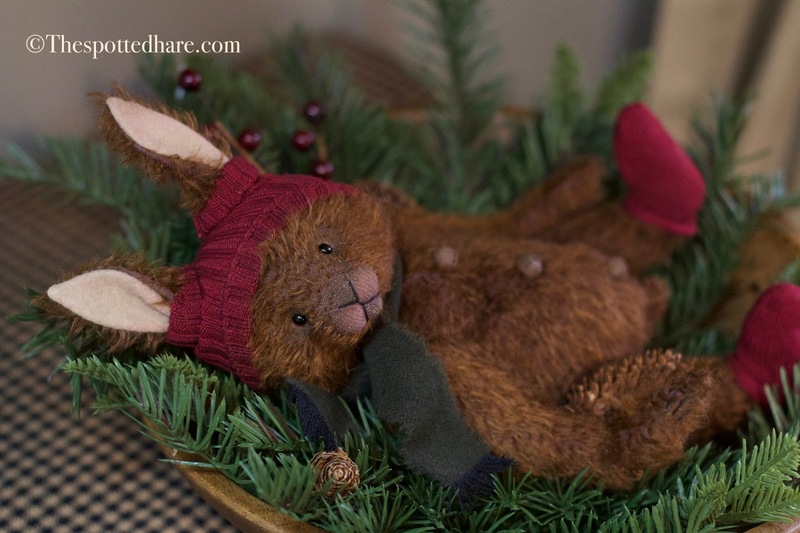 A sweet bunny of hand dyed mohair in a pretty brown shade with a hint of golden. Winter Socks is about 12" to ear tips and is fully jointed. Stuffed with excelsior, poly and a bit of steel shot for weight. cap and socks of knitted "socks". A wool muffler keeps the chill off his neck. The wooden bowl is not included . . .
a similar vignette in a bowl or basket of your choosing! What an adorable little bunny! I hope you have a wonderful Christmas, Lori Ann!